Unless you've been living under a cave, you'll know that this summer is all about bardot necklines. From tops to dresses, the off-the-shoulder options really are endless. When I think my bardot wardrobe is complete, I go and find yet another style that I just fall in love with all over again. As a rule, I generally don't tend to be too provocative when it comes to showing cleavage. Mainly because I've never been blessed in the boobie department. With that said, the bardot style allows you to show off a bit of shoulder cleavage as I like to call it and there seems to be something so elegant about a pair of shoulders, don't you think? 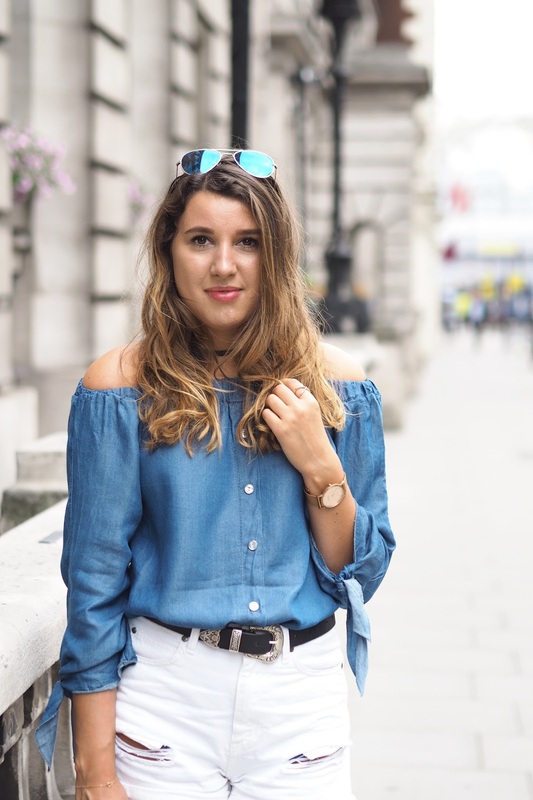 As it was a pretty hot day in London, I decided to pair this off-the-shoulder top with my favourite pair of white denim shorts but generally I love this look with a pair of white skinny jeans. There is something so lovely and summery about a blue and white ensemble even if the latter colour is not the most practical when it comes to someone as clumsy as myself. I embarrassingly recall an incident in McDonalds involving a pair of white skinny jeans an a pot of barbecue sauce. You would have thought I would have learnt my lesson. As I'm loving all things metallic as of late, my 'nanny' shoes were an obvious choice not to mention they are perfect for making your tan pop. They're also super comfortable and believe it or not I'm all about comfort these days. I also love that they give you a little added height whilst still being an appropriate footwear choice for running between meetings or even going on that much needed coffee run. As they say, give a girl the right shoe and she'll conquer the world or at least the local coffee shop (insert winky face emoji). I would like to take a moment to say a massive thank you for the lovely comments and words I received on my 'misconceptions surrounding blogging' post. Admittedly, I was apprehensive about how it would be received by you guys but the general notion is that you really admired my honesty. It really means the world so thank you again. On that note, I hope you have a lovely weekend, let's hope the sun keeps his hat well and firmly on for us all. I love this outfit - you look incredible! Bardot tops are my go-to at the moment. I love the white - I am obsessed with white to show off my tan at the moment haha!